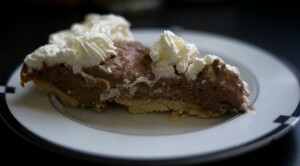 So one of my important culinary goals for a while has been to develop a really good Chocolate Cream Pie recipe. As I sit to write this I am suddenly struck by why I have not tried to find a recipe, but I haven’t. Instead I have decided I need to make one myself.